This magnificent gold-covered staff was created to serve as an insignia of office for an okyeame, a high-ranking advisor to an Asante ruler. The position of okyeame encompasses a broad set of responsibilities, including mediation, judicial advocacy, political troubleshooting, and the preservation and interpretation of royal history. The okyeame’s most visible public role is as principal intermediary between the ruler and those who seek his counsel, leading to the popular characterization of his profession as being that of a linguist. Drawing upon vast knowledge and considerable oratorical and diplomatic skills, the okyeame eloquently engages in verbal discourse on behalf of the chief and his visitors. He relays the words of visitors to the king and transmits the king’s response, often with poetic or metaphorical embellishment. 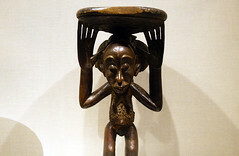 Imagery on the finial of linguist staffs typically illustrates Asante proverbs about power and institutional responsibilities. Here, a spider on its web is flanked by two figures, representing the proverb: “No one goes to the house of the spider to teach it wisdom.” The spider is a fitting symbol for respect due to a person with great oratorical and diplomatic skills. In Ghana, Ananse the spider is the bringer of the wisdom of Nyame, the supreme creator god of the Asante, and is the originator of folk tales and proverbs. The staff is composed of a long wooden shaft carved in two interlocking sections and a separate finial attached to the base. It is covered entirely with gold foil, a material that alludes to the sun, and to the vital force or soul contained within all living things. 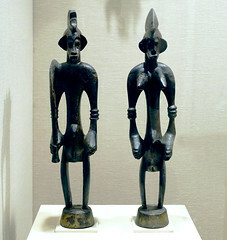 Although the institutional office of okyeame is believed to be centuries old, the use of figural wooden linguist staffs as insignia is probably a more recent development. Prior to the late nineteenth century, linguist staffs took the form of a simple cane, a tradition likely borrowed from European prototypes in the mid-seventeenth century. 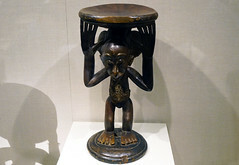 During the late nineteenth to early twentieth century, the British gave official staffs, often made with figural finials, to Akan chiefs who represented the colonial authorities. Since 1900, hundreds of figural linguist staffs have been carved not only for linguists but also for representatives of other institutions, such as associations of fishermen, carpenters, and musicians. 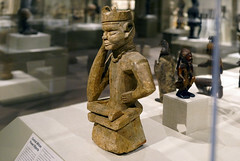 The Asante kingdom, part of the larger Akan culture, was formed around 1700 under the leadership of Osei Tutu. Osei Tutu brought together a confederation of states that had grown wealthy and powerful as a result of the area’s lucrative trade in gold, sold to both northern merchants across the Sahara and European navigators. The centralized system of government that emerged was a complex network of chiefs and court officials under a single paramount leader. A variety of gold regalia was used to distinguish rank and position within the court. Cite this page as: Dr. Christa Clarke, "Linguist Staff (Okyeamepoma) (Asante peoples)," in Smarthistory, October 10, 2016, accessed April 21, 2019, https://smarthistory.org/linguist-staff-okyeamepoma/.